Countless heirloom varieties are grown in semi-forest areas near the river Hamile. The soil is rich, loamy and brown. Harvesting time is between November and January. In combination with the microclimate and an annual rainfall of more than 1,700mm, extensive maturity duration and the natural process brings a sweet, floral, rich, silky and balanced cup. 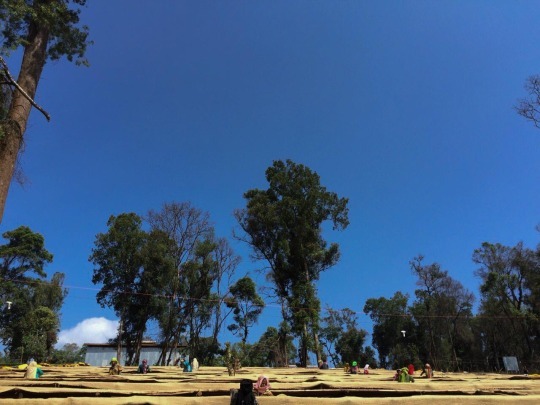 Coffees like this one located in Southern Ethiopia are produced from distinctive traditional Ethiopian varieties of Arabica long grown in the region. Like virtually all southern Ethiopia coffees, this coffee is produced by villagers on small garden plots interplanted with food and other subsistence crops. This is a dry-processed or “natural” coffee, meaning the beans were dried inside the fruit rather than after the fruit has been removed, as is the case with wet-processed or “washed” coffees. Fresh-roasted coffee, delivered when you need it, for the same price you pay at the grocery store or cafe. We are in pursuit of the best coffee beans. Our process ensures only the finest quality, handpicked, Specialty Grade coffee. Freshness is key. We roast in small batches to control all stages of the roasting process ensuring a consistent cup. We ship each order within 48 hours of roasting to bring you the freshest coffee possible. Adjust your deliveries any time. © 2019 EVERYDAY COFFEE ROASTERS. All Rights Reserved.